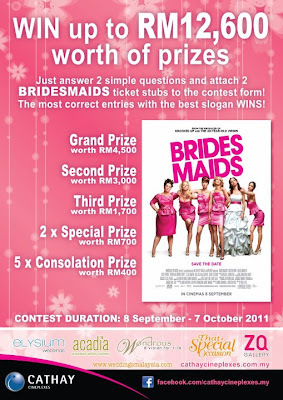 Answer 2 simple question & attach 2 BRIDEMAIDS ticket stubs to the contest form. The most correct entries with the best slogan wins! A pair of prizes will be given out every Monday to Friday at 4pm. There are 30 different prizes. Check it out!